Cleaning is a fundamental phase of the conservation and maintenance activity of the cultural heritage. It is required to be highly effective in the removal of undesired deposits, controllable at every stage and gradable, selective, and completely respectful of the substrate. Moreover, cleaning procedures which can also assure to be harmless to the environment and the operators are particularly valued nowadays. According to these general guidelines, in the present work a sustainable approach for the cleaning of indoor surfaces of the cultural heritage is presented. A methodology based on agar gel was setup and preliminary tested on pilot areas. It has been then applied to the stone sculpted surfaces of the “Fuga in Egitto” high-relief of the Duomo of Milan. A multi-analytical approach was carried out during the setup phase to compare the efficacy of different cleaning conditions in terms of agar concentration, application time and presence of additives. Hence, spectrophotometric measurements, optical observations, ESEM-EDX analyses, Fourier Transform Infrared Spectroscopy, and X-Ray Diffraction were performed. Specific attention was paid to the aesthetic features of the sculpted surfaces before and after the cleaning. 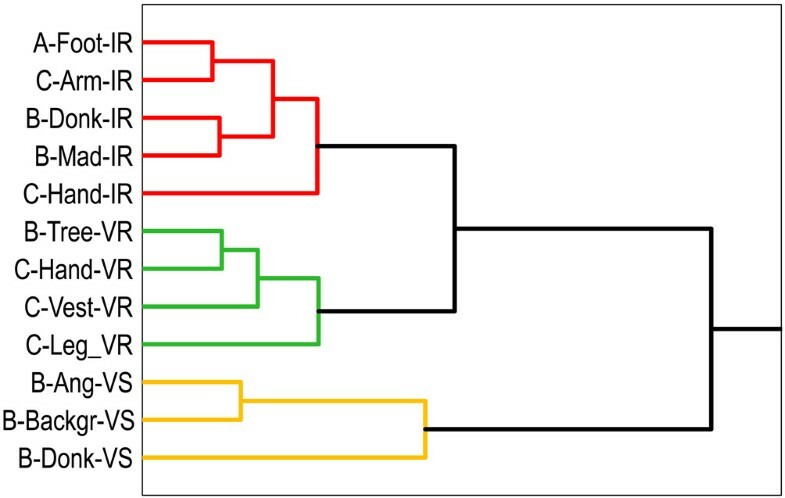 For this purpose, spectrophotometric data have been analysed by multivariate analysis techniques such as Principal Component Analysis and Hierarchic Cluster Analysis. The overall intervention has been monitored to evaluate the cleaning results and to confirm the absence of any damage to the stone substrate. The application of agar gel proved to be effective in removing soluble salts and soot particles, as well as very respectful of the valuable sculpted surfaces. This methodology is also totally safe for both the operators and the visitors, it is based on a natural and low-cost raw material, and it is low time-consuming. It can be therefore considered as a sustainable alternative to the traditional procedures. Cleaning is a fundamental phase of the conservation and maintenance activities of the Cultural Heritage. According to the current guidelines [1–3], its primary objective is the removal of all deposits, undesired layers and potentially harmful substances which can cause irreversible damage as a result of the prolonged interaction with the stone substrate . It is therefore to be considered a very delicate and irreversible procedure, because under no circumstances the removed material can be retrieved and even the most respectful methodology may cause slight damage of the surface . A wide range of methodologies has been developed and are currently available for stone cleaning, based on several mechanical, chemical or physical mechanisms [6–8]. Each one of them has specific features, advantages, and drawbacks which have been extensively reported in the literature . The selection of the most appropriate cleaning methodology should follow the precise knowledge of the substrate characteristics (i.e. constituent materials, stratigraphy, possible presence of previous conservative treatments, etc.) as well as of the composition of the materials to be removed (i.e. chemical composition, thickness of overlapped layers, penetration depth of deposits, adhesion to the stone substrate, etc.). As a general rule, the cleaning methodology is required to be highly effective and specifically selective in the removal of undesired deposit and harmful compounds alone, being at the same time extremely respectful of the substrate. The fulfilment of such conditions can be assessed through the evaluation of basic criteria which include: physical and chemical harmfulness; homogeneity of the removal of the deposits; efficiency of cleaning; absence of aesthetic alteration; durability . A wide range of non-destructive or micro-destructive techniques can be used on selected pilot areas to preliminary asses all the previously mentioned criteria, prior to the global intervention, even though a shared protocol for the in situ evaluation of the cleaning results has not been defined so far. The durability criteria, in particular, obviously require at least a medium to long-term monitoring of the overall treated surface to define the actual effectiveness of the procedure over time with respect to the exposure conditions (microclimate, quality of air, particulate matter composition, etc. ), as well as to detect every possible alterations of the substrate. In the present work, a sustainable approach for the cleaning of indoor surfaces of the cultural heritage is presented. A cleaning methodology based on agar gel applied on stone sculpted surface of the Duomo of Milan was defined, preliminary tested and then applied. The Duomo is one of the most iconic and well-known Italian monuments, a document of historic and material culture of paramount importance, and a primary touristic resource. Its location in the very centre of a particularly polluted city , as well as the great number of people constantly visiting the interior of the church, determines the need for a continuous maintenance of the marble surfaces and of the sculpted decoration. In particular, the progressive accumulation of particulate matter is a primary cause of blackening. This phenomenon results in the alteration of perception of the interiors and potentially enhances the decay rate of the stone material [12, 13]. The availability of a sustainable, cost-effective and low time-consuming cleaning methodology therefore represents an urgent need for the experts in charge of the monument maintenance. Moreover, the maintenance operations are usually performed during the opening hours of the Duomo, thus in presence of visitors. The demand for totally safe conditions for both the operators and the visitors is a further fundamental criterion for the selection of the optimal cleaning procedure. The evaluation of the agar gel cleaning procedure was conducted on the “Fuga in Egitto” (“Flight into Egypt”) high-relief and on the two lateral caryatids, a sculpted group located in the deambulatory of the Duomo (in the so-called “Tornacoro”), behind the main altar. The relief is part of the Baroque sculptural cycle dedicated to the Stories of the Virgin Mary, made in Candoglia and Carrara marble during the XVII century by some of the most important sculptors of Milan: Gian Andrea Biffi, Marcantonio Prestinari, Giovanni Pietro Lasagna, Giovanni Bellanda, Gaspare Vismara . The entire cycle is composed of seventeen panels, each one sided by a couple of caryatids in forms of sculpted angels. The “Fuga in Egitto” was realized by Gian Andrea Biffi around 1612, whereas the two lateral angels were designed by Francesco Brambilla and made by unknown authors. The overall state of conservation of the sculpted group was not particularly worrying with respect to the substrate cohesion. The marble did not suffer any evident loss of material neither due to disaggregation, nor to surface erosion, thanks to the interior location. On the other hand, the presence of a diffused dark deposit completely altered the colour and aesthetic of the surface, so that the sculpted details could no longer be fully appreciated. Moreover, it is well known that deposits in urban environments can be particularly rich in soluble salts, metallic ions and other potentially harmful compounds which can enhance the degradation rate of the stone [15, 16]. The cleaning of the sculptures was then considered as mandatory in order to prevent future decay. As previously discussed, the cleaning operation conducted in this specific context must not interfere with the regular touristic and religious use of the site. Excessive noise, water percolation, production of dust as a result of the deposit removal, or use of aggressive chemical compounds had to be absolutely avoided. It was therefore decided to test the application of agar gels which granted high efficacy, no liquid water release and limited cost. Moreover, agar is completely non-toxic since it derives from natural organic raw materials and can therefore be considered as an eco-friendly and “green” technique. Agar is a water-soluble, neutral, polysaccharide, extracted from several genera of red seaweeds of Rhodophyceae class (Gelidium, Gracilaria, Gelidiella, Pterocladia, Sphaerococcus genera). It is made of two polysaccharides, agaropectin and agarose. The latter derives from disaccharide agarobiose units sided by 3-linked β-D-galactopyranosyl and 4-linked 3,6- anhydro-α-L-galactopyranosyl units . Thanks to its gelling properties, agar is applied in several different fields: in biology for the preparation of culture media , in chemistry as electrode binder for electrolyte cells , in pharmacy for drug delivery , in the food industry as thickening agent. Once the agar powder is mixed in water suspension and heated up to 80°C, it develops a random coil structure which is able to progressively rearrange and gel during the cooling stage, below 40°C. It then forms thermo-reversible physical gels, characterized by ordered double helix chains linked by hydrogen bonding . The terminations of the chains remain in the coil form, available to join with other terminations and creating a 3-dimensional reticulum . The resulting microstructure is well-ordered, with a high number of pores, having rather homogeneous pore size distribution, which enhance water retention and allow liquid water migration within the gel . When agar is applied as a water-based poultice, the solvent effect of water is therefore promoted: in presence of soluble deposits the dissolution is favoured and the dissolved material is drained into the gel structure, which acts as a “sponge”. Agar gels can also be prepared by adding surfactant or chelating agents into the water solutions, to create gels characterized by a variable pH for the treatment of specific substrates . All these characteristics make the use of agar gel particularly valuable in the cleaning of cultural heritage surfaces. Its high water retention promotes the soluble salt extraction, whereas its transparency allows a constant visual control of the underlying material. As for the possible application techniques, agar can be used as a dense solution applied by brush on a surface, as well as a preformed rigid gel overlapped to the substrate. In both cases, its final removal at the end of the procedure is facilitated by the low adhesion to the substrate, and it leaves almost no residues on the surface . During the cleaning, agar gel can limit the contact of liquid water with the treated surface respect to more traditional poultices based on cellulose pulp, japanese paper or sepiolite, thus preventing solvent migration throughout the surrounding areas . This aspect becomes very important in the case of particularly absorbent or delicate materials to be cleaned, such as paintings on canvas and on panels, mural paintings [26, 27], wood , stones [29, 30], plaster , paper and textiles . Moreover, differently from agar, some other gels such as cellulose ethers (Klucel G, Tylose, HPMC) or polyacrylic acid-based gels (Carbopol or Carbometer) are reported to have compatibility issues if applied on specific substrates and in presence of solvents . It is also worth noting that agar is capable to retain the deposit and materials removed, thus compounds allowing a more efficient control of the cleaning procedure. 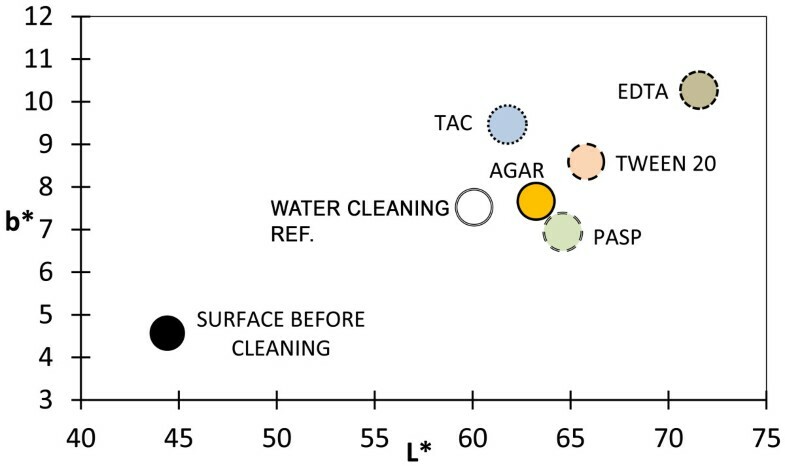 Agar has been already used in the cultural heritage field as a successful cleaning methodology, but only a limited number of applied case studies are reported in the scientific literature [25–34], whereas a thorough evaluation of its efficacy and harmfulness is still lacking so far. The diagnostic activity to support the conservative intervention of the sculpted group of the Duomo started in 2012 and lasted for almost two years. It supported the entire cleaning procedure: starting from the preliminary characterization of the substrate and deposits, to the subsequent set-up of the cleaning operations on pilot areas, followed by the constant monitoring of the cleaning results and to the final assessment of the cleaned surfaces. In order to set-up the final method, a multi-analytical approach was carried out both in situ and in the laboratory to compare the efficacy of different cleaning conditions in pilot areas by using the following techniques: spectrophotometric measurements (colorimetry), optical observations, ESEM-EDX analyses, Fourier Transform Infrared Spectroscopy, and X-Ray Diffraction. At the end of the intervention, an investigation of the marble surfaces was performed to evaluate the cleaning result and to confirm the absence of any damage to the stone substrate. The first stage of the diagnostic activity was dedicated to the characterisation of the substrate, as for the constituent stone material and the evaluation of the overall state of conservation, and to the analysis of the deposits. A wide and almost horizontal area in the lower part of the high-relief was then chosen for the pilot applications. This part, indicated in Figure 1 as “setup area”, was selected thanks to its homogeneity with respect to the apparent finishing of the surface and to the overlapped deposit. It has to be pointed out that due to its orientation, the accumulation of particulate matter and dust is favoured in this location and determines a darker colour respect to the surrounding areas. A total of 24 comparable testing areas were then defined to evaluate different cleaning conditions in terms of agar concentration, application time and presence of additives. An effective cleaning methodology was setup accordingly. During the second stage the defined methodology was applied to remove the dark deposit which covered all the sculpture surfaces. 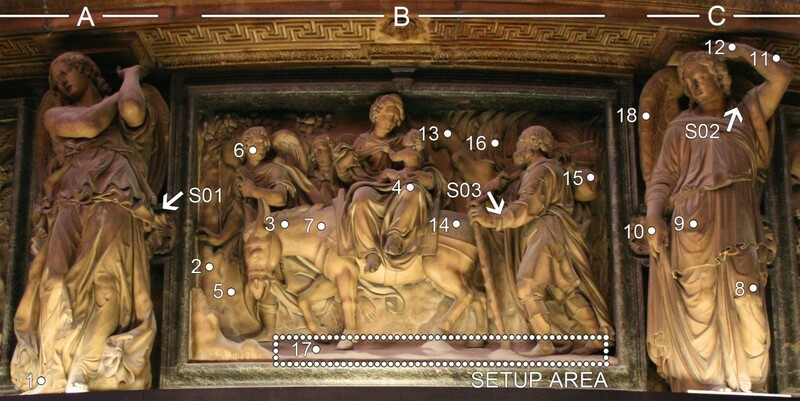 Photographic documentation of the high-relief (B) and of the angels (A, C). The setup area for the pilot applications is defined by the dotted frame; arrows indicate the samples’ location (S01-S03); dots indicate the colour measurement areas (1–18). Agar gels were prepared by suspending agar powder (CTS S.r.l.) in deionised water (concentrations were 1, 2, 3 and 4% w/w) . The suspension was then heated in a microwave oven until boiling point and let to cool down. This operation was repeated twice in order to increase the gel transparency. After cooling down to room temperature a viscous gel was obtained (at 40-45°C). Agar gels with additives were prepared in the same way by dissolving a constant amount of additive (1% w/w) to the water prior to adding the agar powder. The following additives were tested: Tween 20, polysorbate surfactant; TAC, ammonium citrate tribasic; EDTA, ethylenediaminetetraacetic acid (all provided by CTS S.r.l); PASP, sodium polyaspartate (Lanxess). All these additives are commonly used for these purposes except for PASP, which was selected as a possible “green” alternative to EDTA . Agar gels with different concentrations and additives were tested with different application times: 15, 30, 60, 120 minutes. The agar gels were applied by brush on the stone surfaces according to the defined application times. The gels were then easily peeled off and removed. A traditional water cleaning was used as reference method by means of cotton wool swabs and deionised water. Incoherent powder samples of the superficial deposit were sampled by brushing the stone surface. Micro-fragments of the stone substrate were collected by means of a steel scalpel and were chosen in order to be representative of different substrate conditions. In particular, three samples were selected and are discussed in the present work: sample S01 is representative of the incoherent grey powder deposit; sample S02 was collected prior to the cleaning to document the initial condition of the stone substrate, whereas sample S03 belongs to a cleaned area after the treatment. All samples were immediately stored in polyethylene containers until diagnostic. The samples’ locations and the colour measurements areas are indicated in Figure 1. All the details of the colour measurements areas are reported in Table 1. On site microscopy performed before and after cleaning by a portable digital microscope Dino-Lite Premiere AM7013MT, colour CMOS sensor and white LED illuminator. Optical Microscopy (OM) of polished cross-sections by a Leica DMRE microscope equipped with a Leica DFC290 digital camera. Polished cross-section were prepared by embedding selected stone fragments into bi-component epoxy resin. Sections were then polished with SiC paper up to 4000 grid. Fourier Transform Infrared Spectroscopy (FTIR) analyses were carried out with a Nicolet 6700 spectrophotometer coupled with a Nicolet Continuum FTIR microscope. Micro-samples were analysed on diamond compression cells using an MCT detector, with spectral field 4000–600 cm-1 and through a 100 μm aperture. Analyses of powder samples were carried out after dispersion in KBr pellets (KBr FTIR grade Sigma Aldrich) using a DTGS detector in the spectral field 4000–400 cm-1. X-ray diffraction (XRD) analyses were performed on powder samples using a Philips PW1830 diffractometer with Bragg–Brentano geometry and a grazing angle configuration, using a Cu anticathode and Kα radiation (λ = 1,54058 Ǻ). Scanning Electron Microscopy (ESEM) observations and EDX analyses were performed on sample fragments and polished cross-sections using a Zeiss EVO 50 EP environmental scanning electron microscope, equipped with an Oxford INCA 200 - Pentafet LZ4 spectrometer. Spectrophotometric measurements were carried out with a Konica Minolta CM-600D instrument equipped with a D65 illuminant at 8°, wavelength range between 400 nm and 700 nm. Measurements were elaborated according to the CIE L*a*b* standard colour system: twenty measurements were performed on each area and the average results of L*a*b* were used. 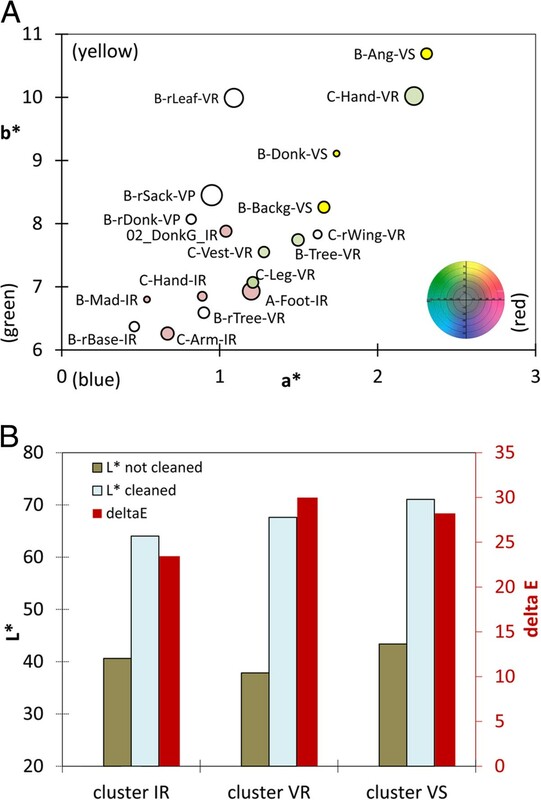 Data have been analysed by multivariate analysis techniques such as Principal Component Analysis (PCA) and Hierarchic Cluster Analysis (HCA) with the attempt to better study and understand the colour conditions of the surface before and after the cleaning. PCA and Hierarchic Cluster Analysis were performed by using V-Parvus 2010 software [http://www.csita.unige.it/software] on all colour (L*, a* and b*) and spectral data from 400 to 700 nm. After preliminary visual observation, the sculpted surface showed a particularly dark and dull appearance. This was due to the ubiquitous presence of two different types of superficial depositions: an incoherent, grey in colour deposit which was scarcely bonded to the stone and could be partially removed by mild mechanical actions and a compact and thin deposit strongly attached to surface. As a result, the overall colour of the stone substrate varied from grey to dark brown/yellow areas (Figure 2). In particular, the grey appearance mostly characterized the semi-horizontal area in which the normal dust deposition is favoured by gravity. In all the surfaces having an almost vertical orientation or partially protected by dust deposition, a more dark-brown to yellow colour was observed. Moreover, the stone material was irregularly covered by a diffused pattern of yellow drops of translucent materials (Figure 2B), which could be observed by naked eye. 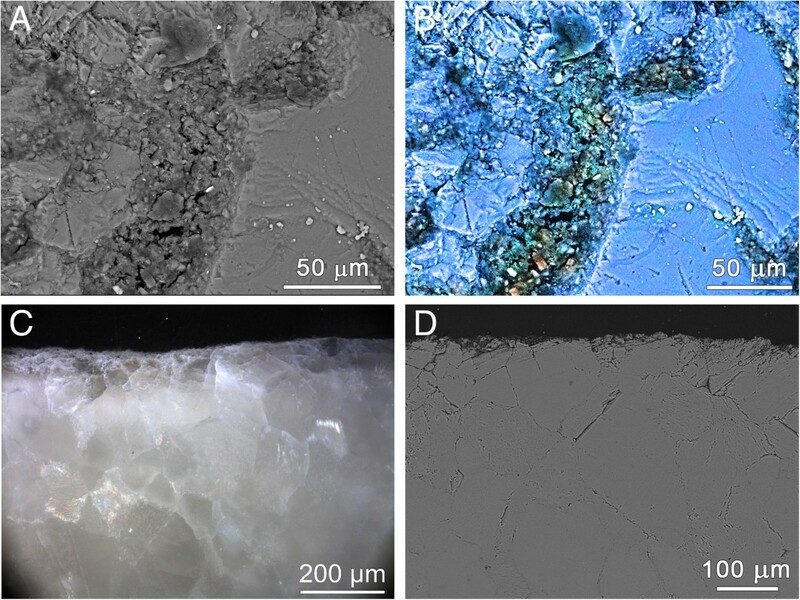 Onsite microscopic documentation of the surface before cleaning, showing a predominant grey (A) to dark brown/yellow (B) colour of the deposit. Samples of the incoherent grey deposit have been collected by brushing the surface, whereas powder materials belonging to both the darker and brown-like areas have been sampled by scraping the uppermost layer of the stone surface. The XRD and FTIR analyses of the two types of deposits did not highlight significant differences under the compositional point of view. The incoherent material was particularly rich in gypsum (characteristic doublets at 1683–1622, 1140–1118, 670–600 cm-1), nitrates (sharp peak at 1384 cm-1) and calcite (peaks at 1428, 876, 713 cm-1). The broad peak around 1044 cm-1 and the doublet at 779–799 cm-1 are related to the presence of quartz-siliceous compounds. The 1324 cm-1 peak indicates that calcium oxalate was present as weddellite. Weak peaks in the 1950–1850 cm-1 region indicates that organic compounds were present as well. The results of the adherent deposit characterization highlight a rather comparable situation. A slightly lower content of gypsum respect to the calcite one could be observed in this case, as a result of the marble substrate contribution to the overall composition. A dichloromethane extraction of the deposit samples has been performed to fully characterize the organic fraction. The resulting sharp peaks at 2950, 2915 and 2850 cm-1 (C-H stretching), 1740 and 1712 cm-1 (C = O stretching), 1460 cm-1 (C-H bending) and 1165 cm-1 (C-O stretching) are typical of a natural wax, most probably beeswax. Due to the peaks overlapping, the presence of further compounds such as paraffin cannot be excluded. Micro-samples of the translucent yellow drops have been analysed in diamond compression cell mode and a similar composition has been found also in this case. It is known that movable candleholders were employed in the past as lighting systems in the interior of the Cathedral. This can be therefore considered as the most likely source for the presence of wax in the superficial deposit and as single tiny drops over the stone material, although the presence of residual traces of an intentional waxing treatment cannot be excluded.The morphological characterization by ESEM-EDX of the stone surface before cleaning (sample S02, see Figure 1) is reported in Figure 3. It can be observed that the superficial deposit was mainly composed by aggregates of fine grained crystals, with an average size lower than 10 μm (Figure 3A). Few coarser particles can also be observed. The deposit showed a limited compactness due to the presence of voids and discontinuities. Its finer fraction was particularly rich in S and Ca (Figure 3B) which are related to the presence of gypsum, as previously discussed. The larger Si-rich particles belong to soil dust, as well as those containing aluminium and potassium. The stone substrate appeared completely covered by an irregular layer of deposit (Figure 3C). The observation of the polished cross sections indicates that its average thickness was generally below 20 μm. In presence of discontinuities of the substrate this value could increase as the deposit tended to fill holes and gaps of the stone material (Figure 3D). The overlapped deposit layer was strongly attached to the substrate from which can be discriminated by the depletion of the Ca content and the enrichment of both S and Si. The sulphur presence was concentrated within this layer alone and no transition in its concentration is observed at the stone interface. This indicates that gypsum comes from an external source and no significant sulphation is still occurring to the detriment of the stone. The state of conservation of the substrate is rather good also under the cohesion point of view. Besides few small cracks crossing the stone matrix, no sign of granular disaggregation or grains corrosion typically associated to the marble weathering are present. This contributes to prevent a deeper penetration of the gypsum thus preserving the inner part of the stone material from gypsum accumulation. The superficial deposition of soil dust and gypsum is therefore to be considered the main decay phenomena currently acting on the sculpted surface.The colorimetric characterization of the stone surface is reported in Figure 4. It can be observed that the results tend to be differently located respect to the colorimetric coordinates (a* and b*) although a clear distinction cannot be made. In order to highlight the presence of any possible correlation between the colour data and the specific features of the surfaces (as for orientation and finishing) a Principal Component and Cluster Analyses have been performed (Figures 5 and 6). The contribution of the original variables to the first two Principal Components (PCs) can be easily estimated in Figure 5A where the loadings, the projection of the original variables on the PCs plane, are shown for autoscaled data. The vectors intersecting at the origin represent the original variables. The length of each vector is proportional to its contribution to the PCs, while the angle between any two of them is inversely proportional to the correlation between them. It can be observed that, for instance, the first principal component is positively correlated with all the variables, while the second component is negatively correlated with L*, a*, b* and with all the wavelengths ≥ 550 nm. It can also be observed that a* and b* are highly correlated with the second component and each other. L*, in the other hand, is strongly correlated with the first component. ESEM-EDX characterization of the stone surface (A-C) and of the polished cross-section (D) before cleaning. False colour image (B) indicates the prevailing distribution of calcium (blue), sulphur (green) and silica (red) in the surface deposit. Colorimetric characterization of the stone surface before cleaning. Results are separately reported according to the a* and b* colorimetric coordinates (A), and to the surface lightness (B). Vertical areas with rough finishing (-VR) are indicated in green; inclined areas with rough finishing in red (-IR); vertical areas with semi-polished finishing in yellow (-VS). Loading (A) and scores (B) plots from Principal Component Analysis of the spectral and colour data before cleaning. Cluster analysis representation of the spectral and colour data before cleaning. Table 2 shows the obtained eigenvalues along with the relative and cumulative variance. It can be observed that the first two components explain almost 99% of the total variance. Along these axes, where the variance is the highest, it is therefore expected to have the maximum differentiation among different observations and consequently to detect clusters.PCA score plot (autoscaled data) for the not cleaned surfaces are shown in Figure 5B. 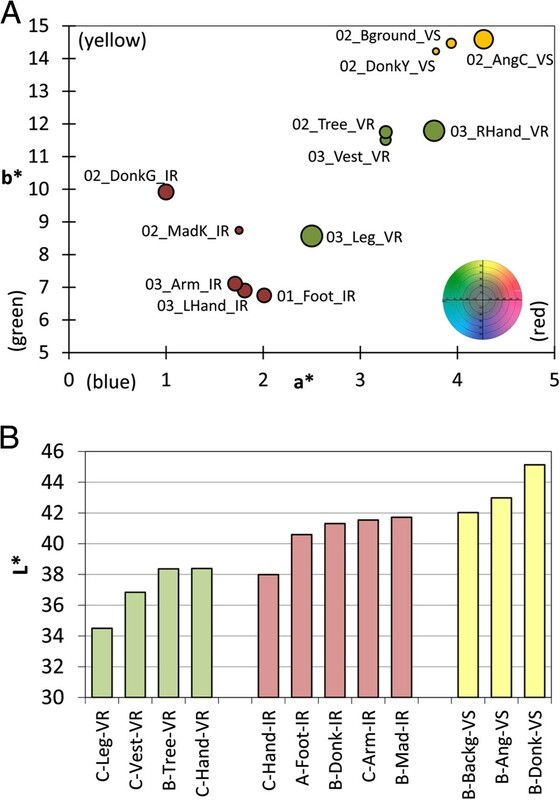 PCA and cluster analysis revealed the existence of three main clusters: VS, VR and IR. As it can be observed in Figure 5, the surface orientation proved to be the most relevant factor influencing the colour of the not-cleaned material. As a matter of fact, data belonging to the vertically orientated surfaces (suffixes -VS and -VR) are clearly separated after the PCA and cluster analysis. This depends on the rather different saturation of the a* and b* values. The vertical areas are generally characterized by a more intense yellow/brown colour compared to the inclined ones which show lower values for both coordinates (Figure 4A). As previously discussed, the superficial yellowing related to the presence of organic compounds is diffused all over the sculpted surface, whereas soiling is more efficient on the inclined areas. This last degradation mechanism therefore plays a major role in differentiate the colour appearance of vertical and inclined surfaces.As far as the vertical surfaces are concerned, it can be noticed that the measurement areas can also be distinguished according to the stone finishing (Figures 5 and 6): rough areas (-VR) belong to a separated cluster respect to those showing a semi-polished appearance (-VS). The latter ones are characterized by higher L* values and by a more intense yellow/brown colour. The lighter appearance is induced by the more efficient reflection of the light typical of polished surfaces. Moreover, the low superficial roughness reduces the adherence of dust and particulate matter, so that the yellow/brown colour is more evident. The preliminary evaluation of the cleaning efficacy after visual and portable microscopy observation revealed that an application time of at least 30 minutes of a 3% agar gel is efficient in the removal of the deposit. Powder samples from the different testing areas as for presence and type of additive have been collected and analysed by FTIR. The final cleaning efficacy has been evaluated with respect to the removal of soluble salts (sulphates and nitrates) and quartz-siliceous compounds. 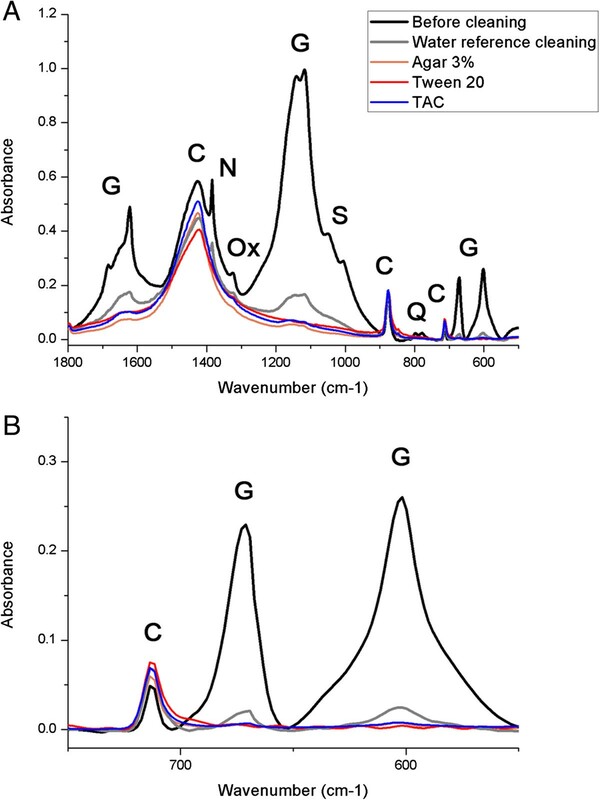 A selection of the most significant FTIR spectra is reported in Figure 7. With respect to the initial situation in which gypsum is the predominant compound, it can be observed that in all cases the agar gels demonstrate a good removal result (Figure 7A). The gypsum content is strongly reduced and only a limited residual presence is evidenced by the small and broad peaks in the 1600 and 1100 cm-1 regions. The same applies to the 1324 cm-1 peak of calcium oxalate, which belongs to the deposit composition and is therefore reduced as well after gel application. The gypsum minor peaks in the 600 cm-1 region are no longer detectable after the treatment (Figure 7B). Agar gels are particularly efficient in nitrates removal. The high volume of free liquid water entrapped in the gel is able to easily dissolve these salts, thanks to their high solubility, and to drain them into the poultice. Quartz-siliceous and other insoluble compounds are removed as a result of the dissolution of the gypsum matrix in which they are initially embedded. Once the sulphates are drained into the poultice, most of the soil dust particles tend to be bonded at the agar-stone interface of the gel. The few remains of deposit material, after the gel removal, have no residual adherence to the stone substrate and are then removed after the final mild brushing of the surface. As far as the deposit removal efficacy is concerned, no significant differences emerge between the pure agar gel and the application of agar gels with additives. On the other hand, if the onsite operative procedures are considered, the presence of additives facilitates the poultice detachment from the substrate and assures a higher solubilisation of the remaining deposit. The overall cleaning procedure become therefore less time-consuming and the final mild brushing of the sculpted surface can be effectively reduced. FTIR analysis of the stone surface before and after cleaning (A); detail of the gypsum removal in the 750–550 cm-1 region (B). The comparison between the agar gel and the water cleaning reference confirms the higher effectiveness of the former methods. The application of a water cotton swab leaves a higher amount of gypsum still deposited on the substrate respect to the agar gels and also allows the permanence of nitrates. In this case, their solubilisation most probably occurs as well but it might be not followed by a suitable draining effect as in the case of the agar gel. Therefore nitrates may be partially re-deposited onto the surface at the end of the treatment.The final aestethic appearance of the test areas is a relevant parameter in order to evaluate the compatibility of the cleaning procedures. The colorimetric results are reported in Figure 8, in which the L* values are plotted versus b*. In such way the expected increase in the surface brightness can be monitored together with the variation of the saturation of the yellow colour due to the warm hue of the stone material. Furthermore, the PCA analysis has shown that the first two components are strongly correlated witht L* and b* respectively. As previously discussed, the almost horizontal orientation of the setup area results in a more intense accumulation of particulate matter and dust. As a consequence, the b* values of the surface before cleaning is lower compared to all the other not cleaned areas. Colorimetric characterization of the pilot areas after different cleaning methodologies. The with dot indicates the application of the reference water cleaning reference; the yellow dot labelled “agar” refers to the agar gel with no additive; in all the other case the name of the additive alone has been reported to indicate the type of gel. All agar gels show rather comparable colorimetric results, expect for the agar plus EDTA which will be discussed separately. The L* values range between 62 and 66, as a result of the efficient removal of the dark deposit. The b* values vary within a very limited interval between 7 and less than 9. Also in this case, the warmer hue of the cleaned stone material respect to the initial situation is related to the slight increase of b*. It has to be noticed that given the very slight variation of both L* and b* among these areas, a clear difference in the final colour appearance cannot be appreciated by naked eye . On the other hand, the L* increase induced by the EDTA-containing agar gel is remarkable and reaches the highest value respect to all other test areas. This corresponds to a whitening effect of the cleaned surface which can also be observed by naked eye and that can be related to a mild etching effect of the substrate . Moreover, the final cleaning result in this case is not homogenous. A spot-like appearance of the surface is visible after onsite microscopic documentation, due to the presence of a sharp separation between cleaned and not completely cleaned areas (Figure 9). The use of Agar gel with EDTA addition has been therefore discarded. Onsite microscopic documentation of the cleaning results after the application of agar gel plus Tween 20 (A) and agar gel plus EDTA (B). According to the preliminary result of the test areas, the final cleaning methodology has been defined as it follows: 3% agar gel added with 1% Tween 20, applied for 30 minutes over the substrate and followed by mild brushing of the stone surface after gel removal. Tween 20 has been chosen not only on the basis of the slightly better colorimetric result with respect to the L* value, but also for practical operative reasons. As a matter of fact, Tween 20 has proved to ease both the detachment of the agar gel from the substrate and the final removal of the remaining dissolved deposit during the brushing operations. The defined cleaning methodology has been applied to the entire sculpted surface of the high-relief and of the lateral angels. The visual observation of the substrate after cleaning confirms that the selected technique is able to effectively remove the superficial deposit and therefore to unveil the remarkable texture and colour variety of the Candoglia marble. As a result, the working traces and surface details which were only partially visible prior to the cleaning are now revealed. Moreover, the conservation of all these intentional small scratches and low-relief sign of the mechanical tools, employed for the sculptures preparation, indicates that the cleaning operation is extremely respectful of the substrate (Figure 10). The removal of the deposit allows identifying a further type of finishing previously undetected. Several areas corresponding to the skin of some sculpted figures and objects (i.e., the hand and arm of an angel, the back of the donkey, the sack of S. Joseph) show a particularly smooth and reflective surface which has been defined as “polished surface”.Optical microscopy and ESEM-EDX documentation of the stone substrate after cleaning (sample S02, see Figure 1) is reported in Figure 11. The superficial deposit, which previously covered the marble, is almost completely removed, so that the compact surfaces of the mineral grains are exposed (Figure 11A). Inside the stone discontinuities (small superficial cracks and partially eroded grain boundaries) some residues of soil dust and particulate matter are still present and can be identified by the smaller and irregular morphology of the crystals. Sulphur, silicon and aluminium can be traced in this location and belong to the remains of the deposit (Figure 11B).In order to qualitatively evaluate the cleaning efficacy the Ca/S ratio has been calculated in three different conditions (Figure 12) according to the EDX results: clean areas (in which cleaned surfaces and residual deposits are both present in the same area); totally clean areas (no residual traces of deposit); partial residues area. A significant reduction of sulphur always occurs as a result of the removal of the gypsum deposit. This reduction is already evident in the clean areas and becomes particularly remarkable in the totally clean areas, in which sulphur is almost completely removed. Even in areas in which the removal is not complete (the partial residues areas), the sulphur content is significantly reduced to approximately 4 times less respect to the not cleaned reference area.Polished cross-sections observation reveals a good and homogeneous cleaning result (Figure 11C, D). The microstructural features of the marble are preserved and no significant differences can be observed respect to the section of the not cleaned material. The mineral matrix is still rather compact. Neither newly formed cracks, nor intergranular corrosion of the stone material can be detected. Some residues of the deposit are present along the upper border of the section, inside the substrate discontinuities, as previously discussed. This indicates that agar gel application is therefore completely respectful of the stone material.Colour analysis after cleaning did not allow the identification of any group of data. Even after PCA and cluster analysis, the only cluster that could be evidenced was the one including the two polished areas. This is most probably due to the fact that, after cleaning, the finishing and the typical texture of the marble are unveiled, so that the orientation is no longer a key factor determining the colour appearance. As a result, the inherent stone features (i.e. natural colour variability, presence of veins, etc.) prevail over environmental factors. The marble texture becomes an additional factor contributing to the apparently more random distribution of the data. The cleaned results show a lower dispersion in the CIE Lab colour space respect to the untreated surface (Figure 13A).In order to better evaluate the cleaning methodology in relation to the initial condition of the surface, the average L* and ΔE of the three cluster defined by analysing the data collected before cleaning are reported in Figure 13B. It can be observed that inclined surfaces are characterised by a lower variation of L* and colour (ΔE). It is worth nothing that soiling was more evident on these areas and in general particulate matter and dust remain longer on non-vertical surfaces, thus allowing a deeper penetration within the stone matrix. Their removal is therefore more difficult. Considering that the overall appearance of the clean surface is homogenous as evaluated both by naked eye and by the lower dispersion of the colour data, the cleaning result has been judged satisfactory. Onsite microscopic observation. Border area between the cleaned and the not cleaned stone surface (A). Working traces and barely visible surface details covered by the deposit are preserved and unveiled after the treatment. The location of the area is indicated by the white arrow in (B). 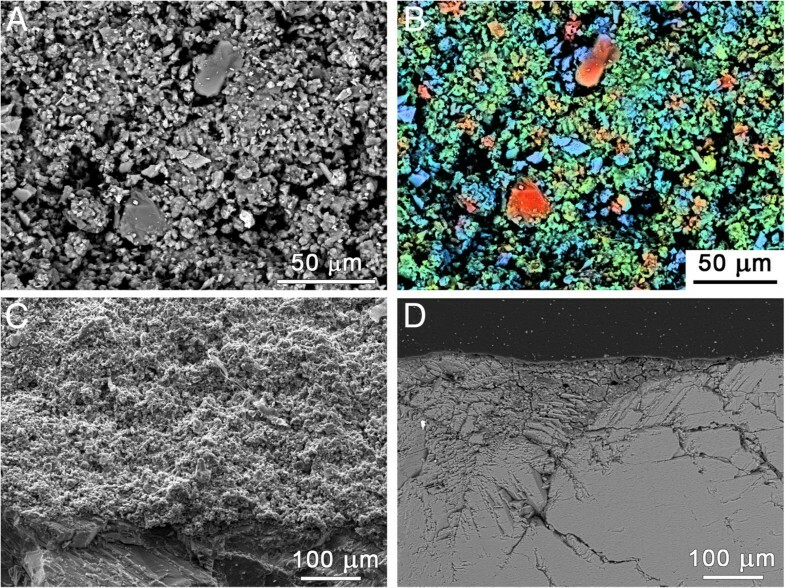 Characterization of the cleaned stone surface (A-B) through ESEM-EDX, and of the polished cross-section through optical microscopy (C) and ESEM (D). False colour image (B) indicates the prevailing distribution of calcium (blue), and of the residual sulphur (green) and silica (red). 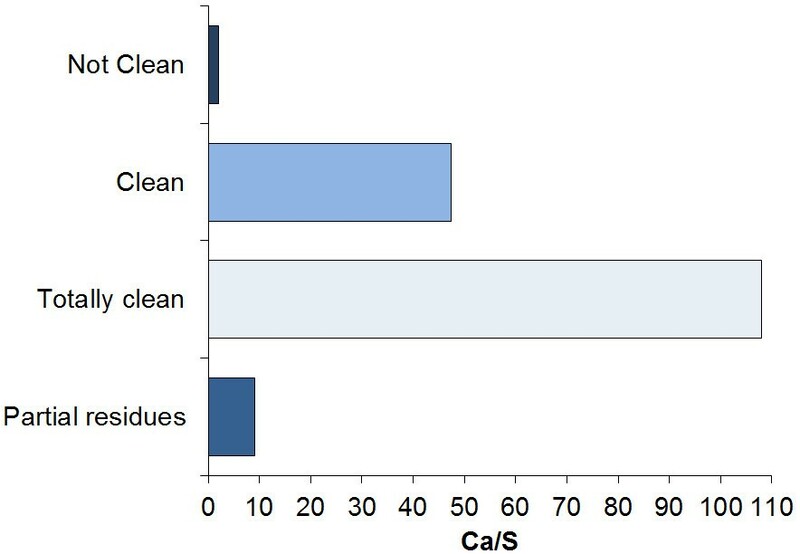 Ca/S ratio qualitatively evaluated in different substrate conditions after EDX analysis. Colorimetric characterization of the stone surface after cleaning. 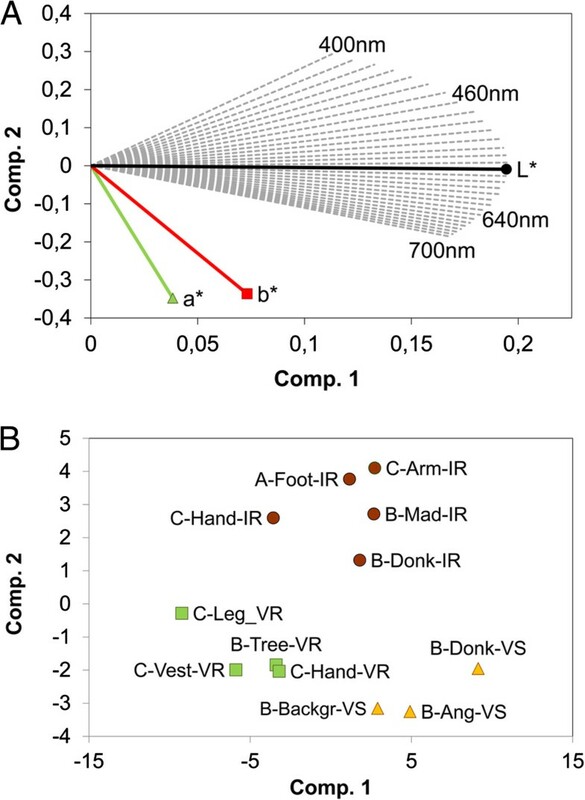 Results are separately reported according to the a* and b* colorimetric coordinates (A), and to the surface lightness and global colour variation (B). White dots indicates additional reference colour areas measured after the treatment the evaluate the global cleaning result. The setup of a cleaning methodology based on agar gel has been defined on a pilot area of the “Fuga in Egitto” high-relief of the Duomo of Milan. Agar gels proved to be effective for the cleaning of the deposits on the marble substrate. Soluble salts (gypsum and nitrates) and soot particles were removed during the procedure which did not cause any damage to the surface. Agar gel also demonstrated a higher efficacy compared to traditional water-based cleaning. Moreover, the addition of chemical additives in low concentrations to the agar gel greatly facilitated the cleaning procedures; as a practical result the deposits could be removed much more easily and the overall operation was less time-consuming. Considering the efficacy and ease of the removal of the deposits, the cleaning homogeneity, the absence of whitening effect and the final aesthetic appearance of the cleaned surface, the best cleaning result was obtained after 1 hour application of a 3% Agar gel concentration with the addition of 1% Tween 20. The defined methodology was then used for the cleaning of the entire sculpted group. The cleaning operations were continuously monitored, as well as the final result. Specific attention was paid to the aesthetic features of the sculpted surfaces. Principal component and cluster analysis of the colorimetric characterization highlighted that, before cleaning, the appearance of the sculpted surfaces was heavily affected by the inclination and by the finishing of the different areas as a result of the diverse soiling deposition mechanisms. After cleaning the colour and the variable texture of the marble were finally unveiled and the inclination was no longer a relevant parameter. The application of agar gel therefore proved to be both effective and very respectful of the valuable sculpted surfaces. This methodology is also totally safe both for the operators and the visitors, it is based on a natural and low-cost raw material, and it is low time-consuming. It can be therefore considered as a very sustainable alternative to the traditional procedures. Authors acknowledge Ing. Benigno Mörlin Visconti Castiglione and Geom. Francesco Aquilano of the “Veneranda Fabbrica del Duomo di Milano” for their support during the research activity and the conservative operations. SG and DG conceived the study and drafted the manuscript. DS, FG, DG performed the analyses and carried out the interpretation of the results. MA and AR performed all the conservative operations. DS and FG helped drafted the manuscript. SG and LT participated in the coordination of the study, and helped to draft the manuscript. All authors read and approved the final manuscript.